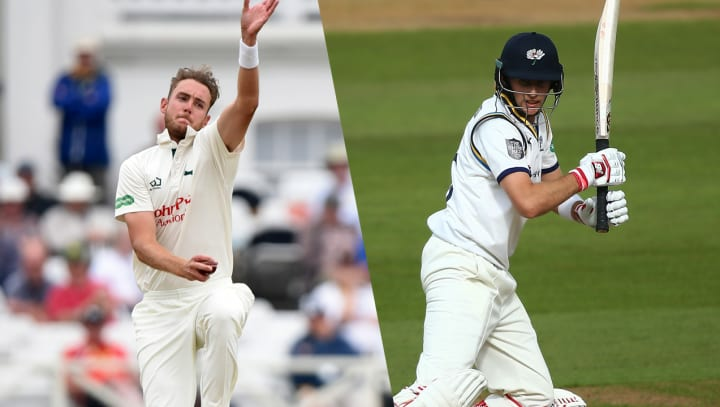 Stuart Broad hopes to see Joe Root pile on the runs for Yorkshire this spring – just as long as it’s not against Nottinghamshire. If the first game of a new county season wasn’t exciting enough, Nottinghamshire’s encounter with Yorkshire at Trent Bridge from Friday 5 April has added importance for Ashes preparations later in the summer. England’s second leading Test wicket taker of all-time will come up against one of the national side’s greatest ever batsmen for their respective county sides. Nottinghamshire versus Yorkshire has quite the subplot. It’s Stuart Broad versus Joe Root. “You’d like to see the England captain scoring runs ahead of the Ashes but hopefully he can save that for the next game,” said Broad. “It’s always exciting to bowl against the best and Rootie certainly is of that calibre. “He’s a world class player, he’s obviously a strength for Yorkshire alongside the likes of Gary Ballance and they are a very dangerous team. “I’ve done a lot of bowling against him in the nets but it will be quite fun to have a go at him out in the middle. “It will be one of those tricky situations. Obviously, I’ll want to get him out and help Nottinghamshire’s chances of winning that game. As a near ever-present in over a decade of Test cricket for his country, Broad’s opportunities to represent Nottinghamshire haven’t always been as frequent as he, or supporters of the Club, would like. However, whenever the chance does arrive to start the season with the Club, the last being in 2017, he is determined to give his all in pursuit of positive results. “When I’ve played early season matches in the past, apart from 2017, I’ve come in after two or three games, so it’s brilliant to be able to start the season from ball one,” said Broad. “I can’t wait. I’ve been following the guys in South Africa on Trent Bridge’s Instagram and Twitter accounts and everyone looks like they’re working extremely hard.